The Charlotte Observer has been on top of the news surrounding Wachovia this week. And there has been a lot of news. The Charlotte-based bank has the financial world buzzing again today after announcing that it would be backing out of its planned sale to Citigroup (which it just announced Monday) and instead would be merging with Wells Fargo. There's still a lot of uncertainty surrounding the deal and analysts still speculate that thousands of Wachovia jobs, particularly in Charlotte, will be lost. Plus, Citigroup has just issued a statement opposing the Wachovia/Wells Fargo deal saying Wachovia has violated its agreement with Citigroup. This will definitely be a developing story. The Observer has posted breaking news and updates on its website all day, all week, and gone even more in-depth in the print edition each day. Yes, it is true that more and more people are getting their news from the web. I read CharlotteObserver.com at least three times a day. But as a journalist (I have a journalism degree; I'm not just a blogger.) and news junkie, I hope that people realize that no matter how or where you get your news, true journalism can't be replaced. You won't get in-depth reporting from YouTube, The Daily Show, or sound bites. We need print journalism, even if it's printed on the web. Now where the newspaper becomes problematic and appears archaic is when breaking news happens overnight, after the print edition has been sent to press. Today's printed edition of The Charlotte Observer mentions nothing of Wachovia's merger with Wells Fargo, but instead continues to report on the rippled effects of the sale to Citigroup. But the Observer did the best it could and began updating stories online this morning. The first one I read was posted at 7:31 a.m. and they've updated it seemingly every hour. 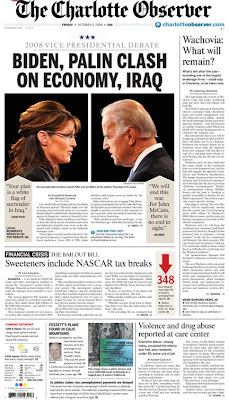 The story in the top right column of today's paper, "Wachovia: What will remain?" quickly became old news. Because fewer people are reading the print edition, which means fewer are subscribing to it, and fewer businesses are advertising in it, revenue is down increasingly at the Observer and newspapers around the country. A couple of my friends and members of my black journalists organization have lost their jobs over the last few months because of layoffs at the Observer. And just this week, the parent company of Creative Loafing filed for bankruptcy (we don't yet know how CL Charlotte will be affected), while last week the local Rhinoceros Times folded its print operations, laid off workers, and will be publishing solely on the web. I hope we find a way to save newspapers because they really are needed. Even though more people are turning to the web, it's not the same. A lot of us are just skimming stories online because the advent of technology and personal devices (laptops, BlackBerrys, cell phones) is giving us short attention spans. But we need to be going deeper than the headlines and soundbites. If you do, you'll realize there's more to the story.